Subscribe to the Final Word! JC’s Final Word is Moving Locations! JC's Final Word is Moving Locations! I just wanted to let all of our subscribers to JC De La Torre’s the Final Word know that this blog is being relocated to our new Transmissions From Atlantis site. You’ll still get updates on the goings on of me and the coming works – but you’ll also get access to our podcasts and commentary on the goings on in the world of Sci-Fi, Fantasy and Horror. I appreciate everyone’s interest and support of this blog and I hope you’ll all join me over at the new digs. Hey there gang, we’ll be doing a new weekly podcast focusing on Sci-Fi, Fantasy and Horror. We call it Transmissions From Atlantis! Our first episode will be recorded today and hopefully out in the ether by Monday. I’ll post an update when it’s published but you can also follow the Transmissions From Atlantis site for more info! 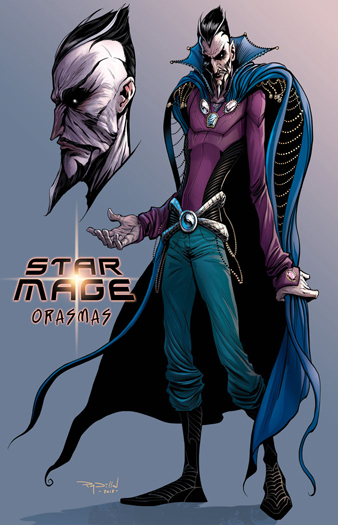 Our fab (and rapidly growing famous) artist Ray Dillon has completed the character design for Darien Connors’ main nemesis in the forthcoming comic, StarMage – Orasmas Xul Sarrum. I don’t really have to say much else do I? Let me know what you think, folks…. Darth Vader, smarth Vader. He can't make evil look this good! Hi folks, with all the crazy fast info coming on Star Mage #1, I forgot to mention that we are indeed continuing the novella series begun in July with Darien Connors and the Necromancy of Eridu (written under my pen name, Jason Dawson). 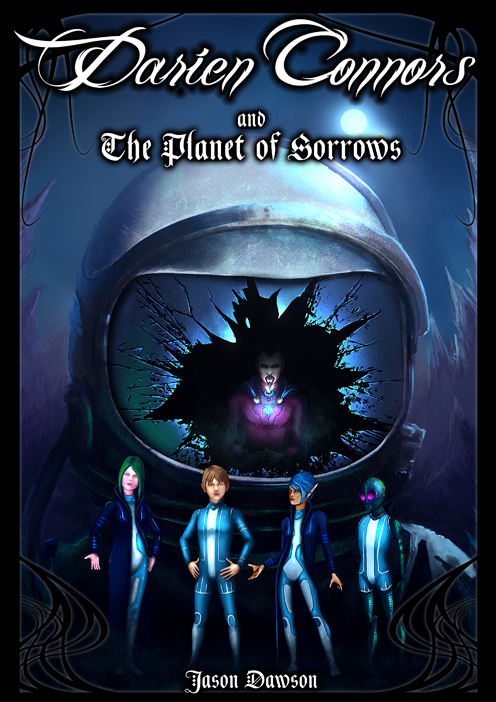 The new novella will be called Darien Connors and the Planet of Sorrows. This one picks up where Eridu left off, as Darien leaves Lambdu Kishpu to look for his father but instead discovers a planet that makes him face his darkest fears. The evil Orasmas returns but we also will be introducing some new villains and allies into the fray…and we ask the question – are the Sarru Kishpu truly the defenders of peace and justice throughout the galaxy as they claim to be or is it all a ruse to hide their true goal of conquering the galaxy? New monsters, alien races, spells and lessons learned by our hero and his friends. Is Dalidor alive? What is Arylos’ darkest secret? We will get definitive answers in this installment. In support of the StarMage project as well as the new Darien novella, we’ve done some enhancements to the http://darienconnors.com site to include more detailed character profiles as well as more information on the Lambdu Kishpu school, the politics of Eridu and Darien’s spell book (coming soon). Please note – the character profile pictures listed ARE NOT the comic book characters. Don’t forget, every Darien novella is only 99 cents – why wait? Get started on Eridu today! Finally, let me close by revealing the cover of Darien Connors and the Planet of Sorrows. Hey there gang, so I revealed in my latest tweet on twitter the first concept art for the main character of Star Mage #1 Darien Connors! Tell me – what do ya think? Darien Connors is coming to Comics! It gives me great pleasure to announce that my young adult Sci-Fi/Fantasy adventure Darien Connors will be developed into a comic book series. It’s also a great honor to announce that acclaimed comic book artist Ray Dillon (twitter: @RayDillon) will be the artist, colorist, letterer and just about everything else you can think of for this book. Ray’s resume is quite impressive, working on my favorite author Anne Rice’s Servant of the Bones comic book adaption. He also worked on NY Times Best Seller The Last Unicorn, the gritty re-imagining of the Teenage Mutant Ninja Turtles – TMNT- Dawn of the Ninja, Jennifer Love Hewitt’s Music Box (I have a few jokes I could um…stick in there…but I’ll leave it be) and Image Comics’ Nightmare World. For those of you not familiar with the Darien Connors series, it follows the exploits of a boy necromancer named Darien who discovers that not only is he not human but he’s part of an ancient war between alien races. While he learns of his power, legacy, destiny and importance to the battle, Darien establishes bonds with new, strange friends and learns his magical craft of Kishpu. All while fighting for his life, his family and peace throughout the galaxy. I’ve always described Darien as a combo between Harry Potter and the Last Starfighter. I know my Darien fans will be excited to see his story spread to another medium. I want you to know I’m going to try to keep the comic as true to the original story as possible but as with any migration to a new medium, some liberties and changes may take place. Just take some solace in that I am the one doing the writing for this comic and you know how dedicated I am to you – my defenders of the realm. I’ll make sure that whatever is changed (if anything) it will be to enhance the story, your understanding of kishpu and the world of Eridu. Keep an eye out for some sample pages in the coming months and hopefully to a comic book store near you! To support the Darien initiative, you’ll be seeing many changes to the main site http://darienconnors.com in the coming weeks. I’ll also try to keep you updated on my twitter feed on the progress. We’re very excited about our collaboration with Ray and we look forward to bringing you a great comic book adventure! Hey gang, you’re running out of time to nab the Taking of Arianna Grayson absolutely free! When the clock strikes midnight, the book returns to it’s list price of 99 cents. What’s this one about? Well, we re-introduce a new character to the Serial series – Arianna Grayson – who takes us through the harrowing chase for the serial killer known as Allister the Annihilator. When she finally catches up to the fiend, she discovers that there’s more to him than being a deranged lunatic. In a struggle for her life, she makes a choice with terrible consequences and her life changes forever. Without dealing spoilers – I can tell you that YES – Jack the Ripper returns in this installment!